Winner of the Just Plain Folks 2006 Music Award for Best Roots Album. New Bluegrass and soaring Appalachian folk come together in the astonishing singing of Susie Glaze. JUST ANNOUNCED! Thanks to CD Baby, this album has won the Just Plain Folks 2006 Music Award for Best Roots Album! Thanks for being a part of this great new wave of awareness, CD Baby! A native Tennessean, actress, singer and recording artist, Susie Glaze grew up in the shadow of the Grand Ole Opry, learning the craft of country and bluegrass from a short distance by regular immersion of Flatt & Scruggs and Dolly Parton among others. When just 16 she accompanied her brother Rick to Nashville's writers' nights showcases, performing his original folk and country music. New York audiences saw her Broadway debut as she played the role of the young Southern matriarch Mary Jane Wilkes in the original Broadway company of Roger Miller's musical play "Big River." After relocating to Southern California and joining the bluegrass group The Eight Hand String Band, Susie made her recorded debut on their 2000 release "The Simple Truth" and was the winner of the Los Angeles 1999 Topanga Banjo and Fiddle Contest and Folk Festival for Traditional Singing. In 2002, Susie's debut solo CD "Home On the Hill" reaped praise from Sing Out! and Bluegrass Unlimited magazines. In 2003 Susie appeared alongside Jean Ritchie at the Conner Prairie Living History Museum's White River Folk Festival, and in 2004 Susie premiered her new concert piece "The Appalachian Songs of Jean Ritchie" at Southern California music festivals. Jean Ritchie writes, "Susie Glaze is a fresh young voice...a communicator, to me the most important of qualities in a singer...quite suddenly I know that, with people like this to trust, my music will go on living, and soaring. And so will I." “Blue Eyed Darlin’” is about artistry. “Blue Eyed Darlin’” is about artistry. It’s about the coming of age of a singer who shamefully has not attained national recognition yet . . . Her music captures your spirit like a master painting holds your gaze…The title song itself, from the pen of Rob Carlson (he wrote seven of the songs that appear here), sets a new standard for the “tear-jerker” type of song so popular among folk and country musicians. To quote Alice Gerrard, “There’s nothing like a sad song”… If you’ve been concerned that folk music is losing its heart, please understand this: the music itself cannot lose heart. Therefore, as long as there are artists like Susie Glaze performing it with heart, all will be well. Walk through “Blue Eyed Darlin’” a couple of times with Susie, and you’ll feel that truth deep in your soul. 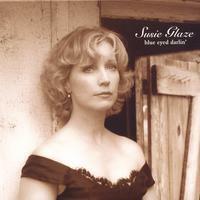 Susie Glaze is an extraordinary singer who has taken her immense talents to a whole new level with "Blue Eyed Darlin.'" What unifies this eclectic folk-bluegrass collection is Ms. Glaze's gorgeous voice which emanates like a force of nature straight from the heart. There are seven original songs on the album which she inhabits so deeply they feel truly timeless. This is stark American music that is drawn from a primal well of love, loneliness, and yearning. It's quite simply a stunning piece of work that should be shared with your friends. And if your friends aren't knocked out by it, then it's probably time for new friends. A lovely voice and a lovely album. Heartfelt and mysterious.